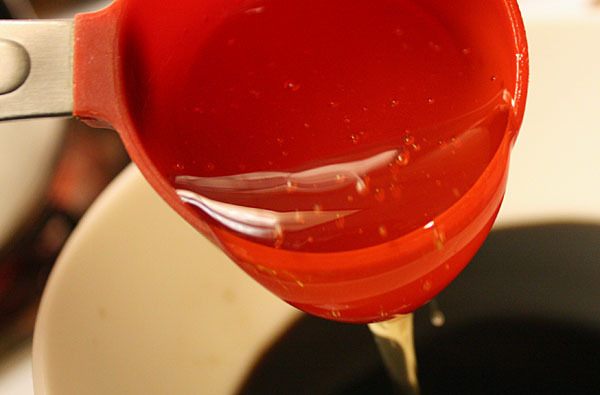 Whisk together 1/4 c of balsamic vinegar, 2 T of honey and 2 T of water. Set aside. Bring a small pot of lightly salted water to a boil. Add 6 cippolini onions and cook for 2 minutes. When cool, peel and cut in half. Set aside, too. While my onions cooled, I cut down my veggies. 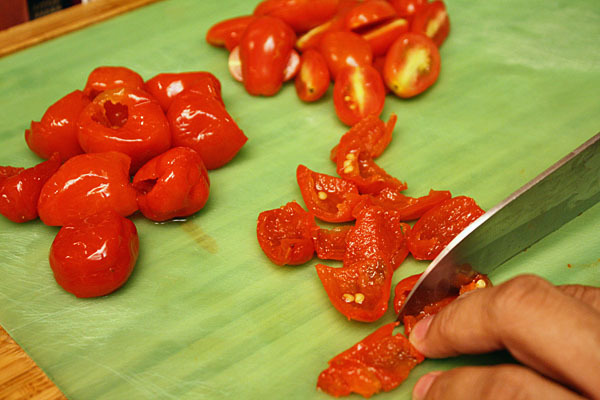 Slice 6 cherry peppers, seed and drop the large dice on 1 large bell pepper and halve 12 cherry or grape tomatoes. Thinly slice 2 T of basil, to be used as garnish at the very end. Reserve in the fridge. 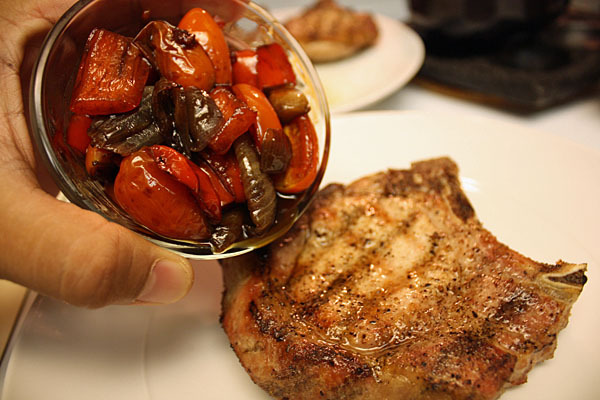 At this point, you can make the peppers and onions, then grill the pork chops, or do both at the same time depending on what you are comfortable with. Either way, when you are ready, preheat the grill to high. Heat 1 T of olive oil in a large saute pan over high heat. Add bell peppers and cippolini onions. 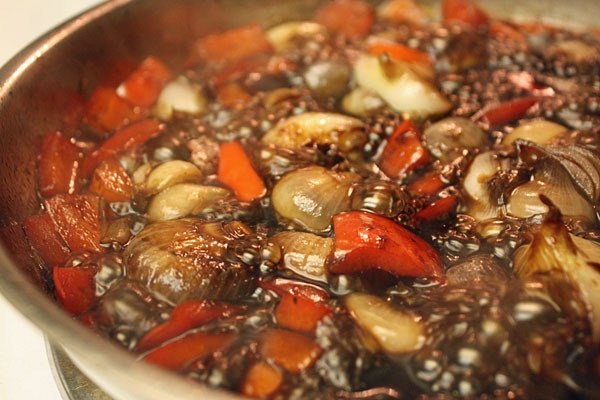 Saute for 1 to 2 minutes until the onions get a little caramelization and the peppers soften. 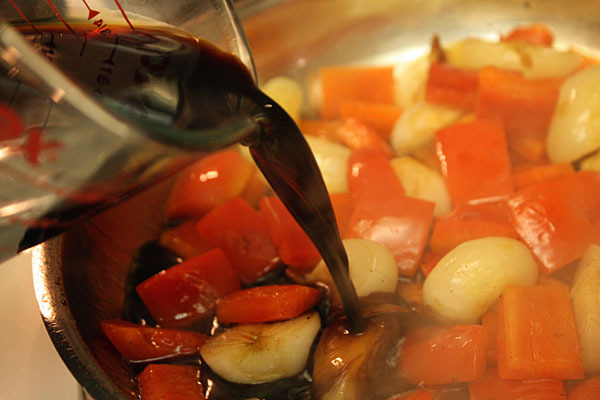 Add balsamic mixture to the pan and reduce by 1/2. This should take 2 to 3 minutes. 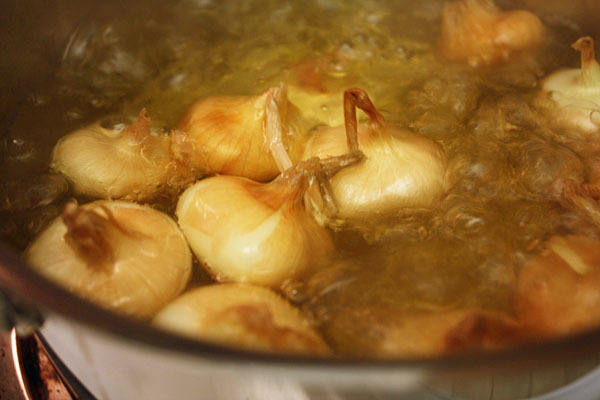 While reducing, spoon the mixture over the onions, giving them a tasty bath. When the mixture coats the back of a spoon, add cherry peppers and tomatoes and turn off the heat. Gently stir together so everything is glazed. When you’re ready to grill, season pork chops with salt and pepper. 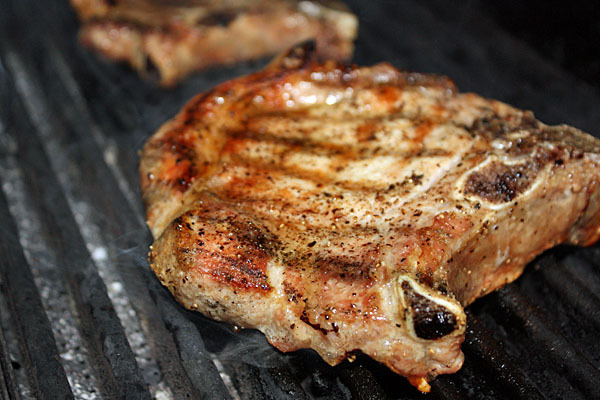 With your grill on high heat, spray the grill with cooking spray and grill pork chops to desired doneness. Chef Brian says he goes for medium, about 3 to 4 minutes per side. Allow the pork chop to rest before plating it. To plate: Place the meat on the plate and top with 1/2 of the glazed vegetables. 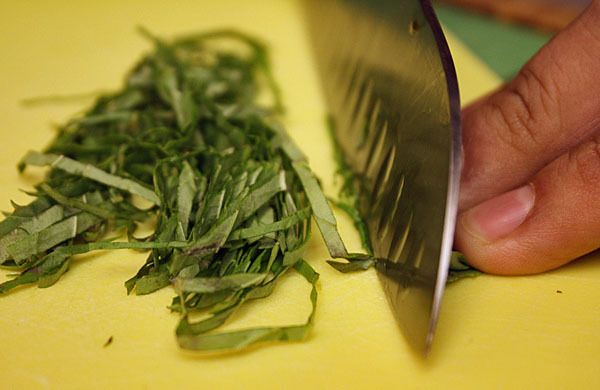 Garnish with chiffonade of basil and serve. This is one of Chef Brian’s easiest recipes to make and Wifey Nadia and I both loved it. The balsamic vinegar and the honey add a complex sweetness to the dish, but the cherry peppers bring enough heat to balance it out. 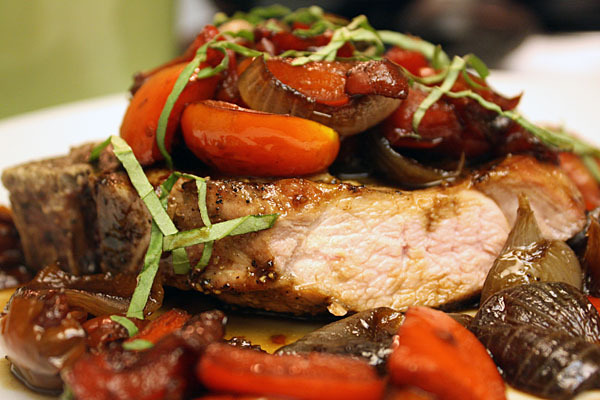 The simply-seasoned pork plays background to the peppers and onions, but each bite finishes with a satisfying savoriness. Not too much work in the kitchen or on the grill. This is my kind of recipe.